AS a Dragon was having a stroll in the forest, a Gallon-Bird saw him from the sky, and swooped down to catch him. The Dragon looked round swiftly for a hiding place, but found none. However, a king was nearby on a hunt and, assuming human form, the Dragon lost himself in the king's retinue. The Gallon was puzzled at the sudden disappearance of the Dragon but soon guessed what the latter had done. So, he assumed human form also and, joining the king's retinue, he scanned the face of every retainer carefully. The Dragon quaked in fear, for he knew that the Bird would recognize him. The king and his company met a group of merchants, who respectfully stood aside for the king and his men to pass. The Dragon slipped into the group of merchants and went along with them. The Gallon-Bird had scanned the face of every retainer, but he did not find the Dragon. After consideration, he realized what the Dragon had done and followed the group of merchants but by that time the merchants were approaching the sandy shore of the sea, and when the Dragon saw his enemy coming towards them, he decided to make a dash to the sea ​​So, assuming Dragon form, he ran across the sand towards the sea. The Bird saw him and, assuming Gallon form, he chased his prey. However, he was just too late, and the Dragon dived into the water and returned to his home beneath the sea. The Gallon wept in disappointment, for he had set his heart on eating that particular Dragon. He felt he could not leave the place where the Dragon entered the water, for he expected that the latter would one day come out of the sea again, and he decided to wait. 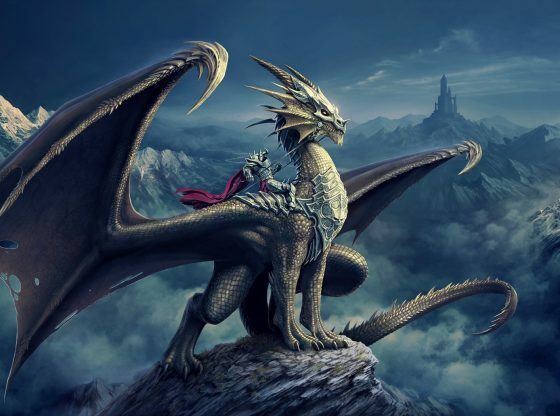 However, he realized that it was out of the question to wait in his own form, for the Dragon would see him from underneath the water and, moreover, human beings would come and harm him. There was a village of salt- makers, who made salt from the sea-water, nearby and, assuming human form, the Gallon joined them. He worked and watched at the edge of the sea every day, but the Dragon did not reappear. The Gallon grew old and died as a morose salt-maker, for he never caught the Dragon after all.